When expecting a baby you look forward to having a healthy and happy child. You know that for the first few years, you will be responsible for all of its needs but expect that with good parenting, the child will grow into a responsible and independent adult. Unfortunately, for some parents, this is not the case. Either you have a baby with serious health problems from birth or you have a child who develops a disease or has a serious accident that requires on-going care for the foreseeable future. A range of people will be involved in your disabled child’s care. The primary contact may be your doctor or health visitor, but as the child develops, a number of other professionals should be there to offer support and advice. If your child has a specific condition, you may be referred to a specialist for tests or treatment that might be necessary. You may also be put in touch with organisations that offer support. For example, if your child is diagnosed with autism, there will specialist organisations for those going through same to turn too for support and help. You will be able to contact these organisations through websites or by contacting your GP. Your child’s needs will be assessed by social services and you will be appointed a social worker (or key worker) who should visit you regularly and ensure that you have all the information you need to make your lives easier. This will vary greatly depending on where you live but your key worker should make sure that services from all the different areas, including health, education and social services, are well co-ordinated. Key workers can act as a central point of contact for professionals working with your family and share information where necessary. A paediatrician is a doctor who specialises in working with children. He or she may see your child at regular intervals to assess their development and monitor any condition that has been diagnosed. Paediatric occupational therapists carry out assessments to see if your child would benefit from using specialist equipment like adapted cups, buggies, or chairs and provide advice on lifting and handling your child safely. They can also help children improve skills like eating and dressing, co-ordinating their body movements and using their hands more effectively. You may be appointed Portage home-visiting, an educational service for pre-school children with special needs. This is usually provided by local education authorities and aims to support the development of a young child’s play, communication and relationship skills. A Portage worker may be a teacher, speech therapist, nursery nurse, parent or volunteer with relevant experience. There is also the Early Support Programme which brings together the different services available to you and your child. It focuses on young children and can be a starting place for you if your child’s condition has not been diagnosed. Despite the amount of help you may be able to access for caring for your child at home, you need to recognise that as your child grows older, it may be better for everyone if a special residential school is considered. 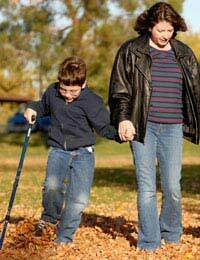 Caring for a child with special needs can have serious financial consequences on you and your family. Disability Living Allowance is a tax-free benefit for children and adults who need help with personal care or have walking difficulties because they are physically or mentally disabled. Also, if you are unable to work outside the home due to caring for your child, you are entitled to claim Carer’s Allowance. Again, you should speak to your key worker to make sure that if you are eligible for these benefits, they are claimed. In addition, if your child is seriously physically disabled, you may be eligible to apply for a blue badge parking permit and exemption from paying for your car tax. The blue badge parking scheme is administered by your local council and the tax disc is available through the DVLC. It can be disheartening and lonely coping with a child with special needs. If you feel isolated, it can be worthwhile to meet with other parents who have similar experiences. There are a number of organisations that offer support groups for specific disabilities and illnesses as well as carer groups. Ask your key worker about the different groups local to you. It is hard coming to terms with the needs of a disabled child and as with all caring, it is important to make time for you. Nevertheless, with the right support, your parenting years should still be rich and rewarding with your child meeting their own personal milestones.